Variation in biting frequency by Anopheles mosquitoes can explain some of the heterogeneity in malaria transmission in endemic areas. In this study in Burkina Faso, we assessed natural exposure to mosquitoes by matching the genotype of blood meals from 1066 mosquitoes with blood from residents of local households. We observed that the distribution of mosquito bites exceeded the Pareto rule (20/80) in two of the three surveys performed (20/85, 76, and 96) and, at its most pronounced, is estimated to have profound epidemiological consequences, inflating the basic reproduction number of malaria by 8-fold. The distribution of bites from sporozoite-positive mosquitoes followed a similar pattern, with a small number of individuals within households receiving multiple potentially infectious bites over the period of a few days. Together, our findings indicate that heterogeneity in mosquito exposure contributes considerably to heterogeneity in infection risk and suggest significant variation in malaria transmission potential. Malaria epidemiology is doubly dependent on the frequency and efficiency of contacts between human hosts and Anopheles mosquitoes, which link the number of mosquito infections caused by an infectious human host and the rate at which uninfected humans acquire infections. Describing the variability in the frequency of human sampling by malaria vectors is therefore essential to understand parasite transmission from and to humans. While at a local level vector density determines average mosquito exposure, even within the same locality individuals may not be equally likely to be bitten by Anopheles mosquitoes (Lindsay et al., 1993; Knols et al., 1995a; Carnevale et al., 1978; Muirhead-Thomson, 1951). Exposure to malaria vectors is influenced by host availability (i.e., amount of time an individual remains unprotected against mosquito bites in an environment where anopheline mosquitoes are present) and attractiveness to mosquitoes (Stone et al., 2015; Yakob, 2016). Availability determines when and where individuals might be sampled by mosquitoes: a multicentre study in Africa that collected entomological and human behavioural data estimated that more than three quarters of human exposure to anopheline mosquito bites occur when individuals are indoors (Huho et al., 2013). For individuals who are accessible to malaria vectors, age and body surface area (Carnevale et al., 1978; Port et al., 1980) are two major determinants of attractiveness to mosquitoes, although other factors also play a role (Knols et al., 1995a). The multifactorial nature of mosquito exposure in malaria endemic areas indicates that, while experimental and quasi-experimental, for example involving modified tents and huts, entomological studies are valuable, they will not accurately capture inter-individual variation in actual exposure. Identifying transmission heterogeneities, especially extreme heterogeneities, is however critical to better inform infectious disease epidemiology and well-established theory has elucidated their implications for pathogen spread and control measures (Woolhouse et al., 1997; Lloyd-Smith et al., 2005). Here, we describe the variability in natural exposure to malaria vectors by linking, through DNA fingerprinting, blood meals of wild-caught mosquitoes to humans living in the households where they were collected. Previously we have shown that these mosquitoes fed more often on adults (Gonçalves et al., 2017). We now extend this analysis to assess the degree of heterogeneity in the distribution of mosquito bites in the population at different times during the transmission season. We also present the frequency of Anopheles species-specific mosquito bites, and potential parasite inoculations (i.e., sporozoite-positive mosquito bites) per individual. We performed indoor resting collections of anopheline mosquitoes in an area with seasonal malaria transmission in Burkina Faso. Thirty-five households were included in this analysis. The median number of individuals living in each study household was 3 (range, 2–8). Reported bed net use among the study participants was high (111/126, 88.1%). At enrolment (October – December 2013), most (79.2%) individuals were parasite-positive by 18S qPCR. In 21/35 houses, all sampled individuals were malaria-infected. We collected 325, 620 and 190 bloodfed Anopheles mosquitoes at the start (2014), peak (2014) and end (2013) of the transmission season, respectively (Table 1). During the 2013 survey, 21/35 houses had at least one bloodfed mosquito collected; in 2014, 19/20 and 20/20 households had fed mosquitoes collected at the start and peak of the transmission season, respectively. The average number of bloodfed mosquitoes collected per day in each household was higher at the start (median 2.3, interquartile range [IQR] 0.7–5.5) and peak (median 3.9, IQR 2.1–8.5) compared to the end (median 0.1, IQR 0–0.6 mosquitoes per day) of the transmission season (p=0.001 and<0.001, respectively). There was no correlation between the average number of bloodfed mosquitoes collected per day and the number of individuals living in each household (Spearman’s rank correlation coefficients, 0.14, 0.09 and 0.05 for the first, second and third surveys respectively; all p>0.05). Of note, at the end of the 2013 transmission season, most mosquito collections performed after mid-November were unsuccessful, suggesting a village-wide reduction in mosquito abundance during this period. †Age at enrolment (first survey). Parasite prevalence was determined by 18S qPCR; gametocyte prevalence by Pfs25 mRNA qRT-PCR. DNA extracted from mosquito blood meals and blood samples from individuals living in study households were genotyped using a microsatellite-based assay (see Materials and methods). Most (1,066/1,135, 93.9%) collected bloodfed mosquitoes had their blood meal analysed. One hundred mosquitoes did not produce discernible amplification products. Mosquito blood meals with multiple human DNA sources (N = 153), and typed blood meals that were not matched to residents of study houses (N = 139) were not included in this analysis. Estimates of mosquito exposure were based on 68.9% (666/966) of the successfully typed blood meals; this percentage was consistent across surveys (64.9%, 71.7% and 69.8% at the start, peak and end of transmission season). In Figure 1, the distributions of the number of mosquito bites each individual received during different study surveys are presented. Approximately 20% of individuals, of all ages, provided 85.1%, 76.0% and 95.5% of single mosquito blood meals at the start, peak and end of the transmission season, respectively. Throughout the study, a small number of individuals, mostly adults, were matched to considerably higher numbers of blood meals compared to the rest of the population. Conversely, 32.0–76.2% of study participants were not linked to bloodfed mosquitoes during the surveys, including 15/77 individuals present in all surveys who were never matched to collected fed mosquitoes. Reported bed net use and parasite and gametocyte carriage at enrolment were not significantly associated with mosquito exposure during our study (incidence rate ratio of 0.70 [95% confidence interval, CI, 0.22–2.20, p=0.55] for reported bed net use versus no net use in a model adjusted for survey and of 3.42 [95% CI 0.50–23.45, p=0.21] and 0.99 [95% CI 0.32–3.10, p=0.99] for parasite and gametocyte carriage at enrolment respectively in models that only included data from the first survey). In an analysis of data from all surveys, negative binomial regression with mixed effects better explained the distribution of mosquito bite counts than mixed effects Poisson models (p<0.001), after adjustments for age, which influences Anopheles exposure in this population (Gonçalves et al., 2017), survey and intra-household data correlation. In sensitivity analyses that assigned blood meals with multiple human DNA sources to the least exposed individuals in each household, the ~20% of the population with most mosquito bites were linked to at least 70% of matched blood meals (Figure 1—figure supplement 1). We also performed an analysis that assigned multiple source blood meals to study participants based on minimal genetic distances to those meals (Gonçalves et al., 2017). This approach results in a similar pattern:~20% of the population received 78.6, 76.3% and 94.2% of all mosquito bites at the start, peak and end of the transmission season, respectively. Inter-individual variation in exposure to Anopheles mosquitoes. In (a) the frequency distributions of mosquito blood meals matched to each study participant are presented for the three different surveys. Data from the peak transmission season are presented as bars; data from the other surveys (non-zero proportions) are presented as coloured circles. In (b) the cumulative proportion of mosquito blood meals (y-axis) matched to study participants (x-axis) sorted by number of mosquito bites received is presented for the different surveys. 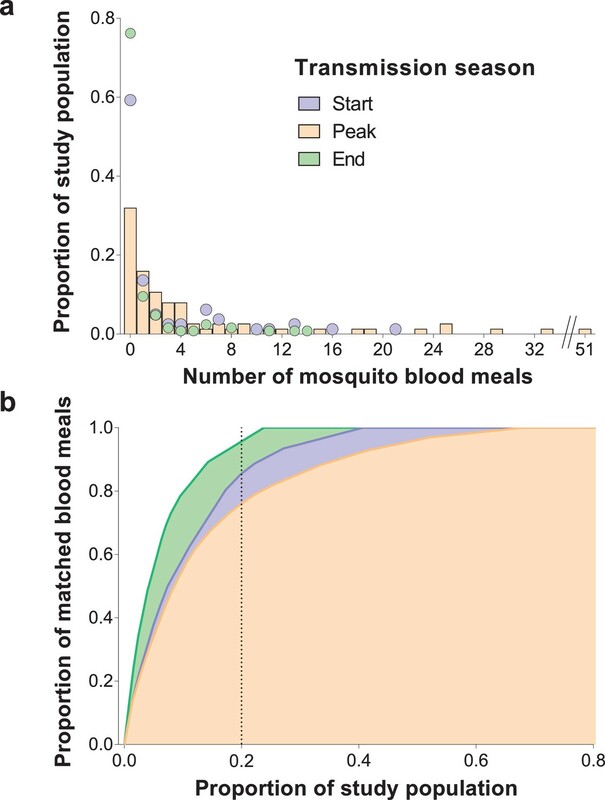 The points where the dotted vertical line intersects the three curves correspond to the highest proportions of mosquito blood meals linked to 20% of the study population. At the peak of the transmission season, six individuals were absent or only present during one collection day and were not included in this graph. Only singly matched bloodfed mosquitoes linked to individuals living in the same household where they were collected are included in this figure. For individuals who participated in all surveys, there were positive correlations between numbers of matched mosquitoes (1) at the start and peak of transmission season (Spearman’s rank correlation coefficient 0.24, p=0.04) and (2) at the start and end of transmission season (Spearman’s rank correlation coefficient 0.34, p=0.002), suggesting some consistency in preferential biting. However, some individuals with highest numbers of matched blood meals at the peak of the transmission season received few or no mosquito bites in other surveys (Figure 2a). Temporal (a) and within-household (b) variation in exposure to malaria vectors. In (a) individuals were ranked (y-axis) according to the number of matched mosquito blood meals at the peak of the transmission season. The left and right, symmetrical, x-axes represent the number of mosquito bites each individual received at the peak (orange bars), and at the start (blue bars) and end (red circles) of the transmission season respectively. Only individuals present during at least three collection days per survey in all surveys and matched to at least one blood meal (N = 62) are included in this panel. In (b) each of the three columns corresponds to a different survey (S, Start of transmission season; P, Peak of transmission season; E, End of transmission season) for a select number of households. Individuals in the same household are denoted by different colours, which are consistent in the different surveys. The proportions of matched blood meals linked to each individual by household and survey are on the y-axis; only the eight households with at least five matched mosquitoes at the start of the transmission season and three or more study participants are shown. The numbers of individuals living in the households are shown above the columns. 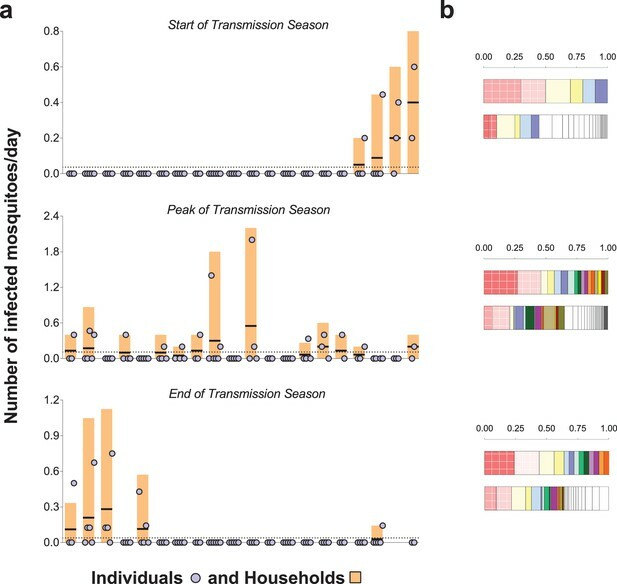 Within-household heterogeneity in mosquito exposure was observed (Figure 2b): considering data from houses with at least three study participants and five matched mosquitoes in single surveys, in 4/8, 14/15 and 7/7 households at the start, peak and end of the transmission season respectively, the most exposed individual was the source of at least 50% of matched mosquito blood meals. While individuals with high numbers of matched blood meals often lived in households with high total numbers of matched mosquitoes (Figure 2—figure supplement 1), in all houses included in this study there were individuals with relatively low mosquito exposure. Mosquitoes collected during the study were genotyped for species identification. At the start of the transmission season, Anopheles coluzzii represented 44.7% (142/318) of all bloodfed mosquitoes, while at the peak and end of the transmission season most bloodfed mosquitoes were Anopheles gambiae sensu stricto (74.0 [450/608] and 53.7% [102/190], respectively). In all surveys, A. coluzzii mosquitoes had higher percentages of blood meals from multiple human sources (20.6, 22.0% and 18.9% at the start, peak and end of the transmission season, respectively) compared to A. gambiae s. s. mosquitoes (11.9, 16.1% and 10.3%). Species-specific distributions of blood meals singly matched to study participants are presented in Figure 1—figure supplement 2 and suggest that heterogeneity in exposure to anopheline mosquitoes occurs irrespective of vector species. Of note, negative binomial models better explained the distribution of Anopheles species-specific mosquito bites compared to Poisson models, providing evidence of overdispersion that is not explained by covariates. In these models, the conditional overdispersion parameter was significantly different from zero: 1.9 (95% CI, 1.2–3.2) and 2.5 (95% CI, 1.8–3.6) for models of A. coluzzii and A. gambiae s. s. mosquito bites, respectively. Additionally, rates at which individuals were bitten by mosquitoes of different species were positively associated (Figure 1—figure supplement 3) (all p<0.001 in mixed effects negative binomial models that included number of A. coluzzii or A. gambiae s. s. matched blood meals, age and survey as covariates). The prevalence of malaria parasites in bloodfed mosquitoes identified via PCR of head and thorax was higher at the end versus start and peak of the transmission season (23.4, 4.9 and 8.0%, respectively), and slightly higher in singly-matched mosquitoes compared to mosquitoes with multiple meal sources (Table 2). A. coluzzii mosquitoes were less often infected compared to A. gambiae s. s. (odds ratio 0.41 95% CI, 0.22–0.76 in a model that adjusted for timing of survey). Individual- and household-level frequencies of exposure to infected mosquitoes are presented in Figure 3a. Only 7.7, 23.6% and 10.5% of study subjects were linked to one or more potentially infectious mosquito meals at the start, peak and end of transmission season, respectively. In each survey, the two individuals with the highest numbers of matched meals from infected mosquitoes experienced 44–50% of all exposure to infected mosquitoes. As expected, there was a positive association between the number of potentially infective mosquito bites an individual received and the total number of matched meals regardless of mosquito parasitological status (Figure 3b, p<0.001 in a mixed effects negative binomial model that had the total number of matched blood meals as a covariate and only included individuals with at least one matched meal). Conditional on the total number of bites, there was evidence of household-level clustering of infectious bites (intra-class [household] correlation 0.19, 95% CI 0.08–0.38, p<0.001 in a mixed effects logistic model that included singly matched mosquitoes); however, there was no evidence of individual-level clustering after adjustment for household-related variability (p=0.50). Prevalence of mosquito infection, determined by PCR performed using mosquitoes’ head-thoraces, by blood meal source (A) and mosquito species (B), and results of mixed effects logistic model on mosquito infection status (C). Rates of exposure to potentially infective mosquito bites (i.e., bites from mosquitoes with malaria parasites detected in their head-thoraces). (a) and their association with total mosquito exposure (b). In (a) blue circles represent study participants; individuals living in the same study house are presented together (orange bars). Y-axes show (i) the numbers of falciparum-positive mosquito bites per individual per day (blue circles), (ii) the total number of falciparum-positive fed mosquitoes collected in each house per collection day (orange bars), and (iii) the number of falciparum-positive fed mosquitoes collected in each house per individual resident in the house per collection day (black horizontal lines in orange bars); y-axes’ limits vary to improve visualization. Horizontal dotted lines represent the average of iii over all houses. Only the 20 houses included in all three surveys are represented in this figure. In the three graphs, houses were ordered according to the number of infected fed mosquitoes collected at the start of the transmission season. In (b) in each pair of bars, each colour represents an individual: the top bar represents individuals matched to infected mosquitoes; the bottom bar, individuals matched to mosquitoes regardless of sporozoite status. Individuals who were only matched to uninfected mosquitoes are represented by white segments. The horizontal axes represent proportions of blood meals. Multiple source meals are not included in panel b. The impact of biting heterogeneity on the resilience of vector-borne disease transmission to control interventions can be estimated using the methods described in (Dietz, 1980; Dye and Hasibeder, 1986): compared to uniform biting, the basic reproduction number (R0) of a vector-borne disease, which corresponds to the number of secondary infections generated by an infectious individual in the absence of any control and any population immunity, is inflated by the factor (1 + α), where α is the squared coefficient of variation of the human biting rate. Figure 4 illustrates the impact that more extreme heterogeneity can have on the calculated R0 of malaria: R0 is increased by a factor of 4.8, 4.2 and 8.4 in settings where mosquito exposure and its variability are similar to those observed at the start, peak and end of the transmission season in our study area. R0 is high even when the skew is reduced by the conservative sensitivity analysis that allocates multiply fed mosquitoes’ meals to the least exposed individuals, yielding R0 increases by a factor of 3.3, 3.2 and 5.7 at the start, peak and end of the transmission season, respectively. 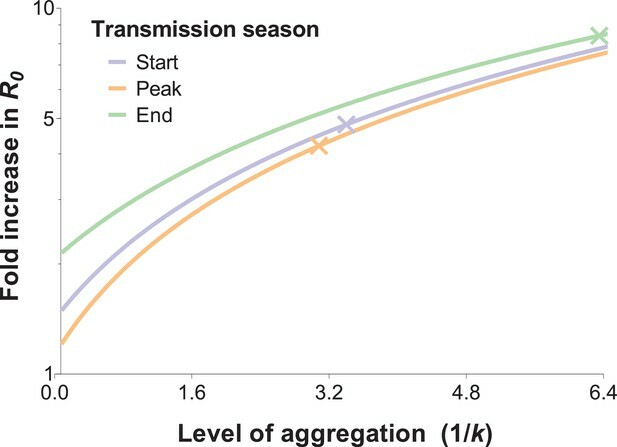 The relationship between the fold increase in R0 and the level of aggregation in mosquito bites. This relation depends on the mean mosquito biting rate (see below), and the different curves represent the shape of this effect for different mosquito exposure levels: blue, orange and green lines correspond to settings where host-vector contact rates (mean numbers of matched mosquito bites) are similar to those observed at the start, peak and end of the transmission season, respectively. Aggregation level increases along with the inverse of the aggregation parameter k from the negative binomial distribution, where k can be calculated as the squared mean number of mosquito bites (μ2) divided by the variance in bite number (σ2) minus the mean, that is k =μ2(σ2 −μ ). R0 is inflated by the factor (1 + α) whereby α = (σμ)2; in other words, α is the squared coefficient of variation (Smith et al., 2007). In the special case whereby bites are perfectly homogenous, the coefficient of variation is zero, and the standard formulation for R0 is regained (Woolhouse et al., 1991; Barbour, 1978). The fold increases in R0 for the levels of aggregation observed in our surveys are represented by the coloured crossed-lines. In this study, we quantified natural exposure to Anopheles mosquitoes using blood meals linked to household occupants. We observed significant differences in the numbers of bloodfed mosquitoes matched to study participants that are consistent with or even exceeding the Pareto rule, with ~20% of individuals being the source of more than 80% of all singly-matched blood meals. This heterogeneity was also apparent within-household, where the individual who received the most bites often contributed more than 50% of anopheline meals. Exposure to potentially infective mosquito bites also followed an aggregated pattern: 5.1, 13.9% and 6.5% of the population experienced 80% of parasite inoculations at the start, peak and end of the transmission season, respectively. Taken together, our observations indicate that relatively few individuals at different timepoints disproportionally contribute to malaria transmission by being repeatedly sampled and infected by malaria vectors. These data provide further insights into the mechanisms that lead to heterogeneity in human malaria infection risk (Bejon et al., 2014, 2010; Mwakalinga et al., 2016; Kangoye et al., 2016). Several previous studies have quantified inter-individual differences in attractiveness and exposure to mosquitoes using a range of methodologies. While studies involving experimental huts (Lindsay et al., 1993) and olfactometers (Mukabana et al., 2002a) demonstrated the influence of individual-level factors such as pregnancy (Lindsay et al., 2000) and infection status (Lacroix et al., 2005) on attractiveness to mosquitoes, community-wide assessments of wild-caught mosquitoes (Port et al., 1980; Soremekun et al., 2004; Vazquez-Prokopec et al., 2016) are necessary to quantify variation in exposure to malaria vectors over larger scales. A study in The Gambia (Port et al., 1980) in the 1980's used ABO group and haptoglobin typing to identify the sources of mosquito blood meals; the small number of variants in these markers (Mukabana et al., 2002b) limited the selection of households. In Tanzania (Soremekun et al., 2004), microsatellites were used to link blood meals to humans to assess the protection afforded by bed nets against mosquitoes; a high proportion of the ~250 analysed bloodfed mosquitoes were matched to individuals sleeping in the same room where they were collected, including in the village with bed nets, and 80% of matched blood meals came from less than 20% of the population. In our study, we matched 666 blood meals to individual study participants and observed that the distribution of mosquito bites was highly overdispersed in relation to a Poisson assumption, with 76.0–95.5% of singly matched blood meals originating from ~20% of the study population. These results corroborate the findings of the study in Tanzania and of a different study in western Kenya (Scott et al., 2006), where 16% of the study participants were matched to 58% of Anopheles blood meals. By examining mosquito exposure repeatedly in an area of pronounced seasonality, we demonstrate even more unequal exposure patterns across three timepoints in the season. Applying simple, well-established (Smith et al., 2007; Churcher et al., 2015) methods, we estimated that the observed degree of mosquito biting heterogeneity could be linked to a 3-fold or higher increase in malaria R0 compared to a random-mixing system. This suggests that in settings with considerable variation in mosquito exposure, heterogeneity in biting is likely to be a major determinant of the coverage of vector control interventions required to reduce and interrupt transmission (Smith et al., 2007). These R0-focused calculations however have limitations. Firstly, although there is a positive relationship between R0 and variability in Anopheles biting, in finite populations increasing aggregation in exposure does not necessarily equate to increasing community-wide infection burden, since in areas with highly heterogeneous mosquito biting a high proportion of parasite inoculations will be on already-infected individuals. Additionally, the framework used here does not account for previously observed interactions between frequency of exposure to infected mosquitoes and rates of immunity acquisition (Bejon et al., 2014; Bejon et al., 2010; Clarke et al., 2002), which could influence blood stage parasite burden and potentially the production of transmission stages in highly exposed, highly immune individuals. Development of detailed mathematical models that explicitly incorporate immunity and spatial dependencies (see next paragraph) would allow more precise estimation of the long-term influence of the observed variation in mosquito exposure on malaria transmission dynamics. The fact that the majority of human-mosquito encounters in each survey involved only a few individuals is a consequence of both between- and within-household variation in exposure. Indeed, at the peak of the transmission season, the household with the highest number of fed mosquitoes had ~150 times more than the household with the lowest number. Household characteristics such as construction material, number of windows, eaves as well as geographical proximity to mosquito breeding sites have all been previously associated with increased exposure to mosquitoes indoors and explain some of the between-household variation in mosquito abundance. To understand the implications of our current findings for malaria control, data on geographical and temporal clustering of Anopheles exposure, malaria infection and disease are needed. A study in Kenya (Bejon et al., 2014) showed that foci of clinical malaria are unstable and that one-month surveillance data, for example, might only have predictive value of higher-than-average transmission over short periods of time. This is consistent with our observation that the ranking of households according to the number of infected mosquito bites per individual varies over time (Figure 3) and poses considerable challenges to sustainably targeting high exposure households for maximum community benefit. We also found that household heterogeneity is compounded by inter-individual variation in frequency of sampling by mosquitoes for people in the same house. At the peak of the transmission season, the maximum difference in numbers of matched meals for participants in the same house ranged from 1 to 51, that is a difference of up to ~10 mosquito bites per day. Age and body size can partially explain differences in attractiveness (Muirhead-Thomson, 1951) yet we often noted age-matched individuals in the same house with dissimilar mosquito exposure. Other individual-level characteristics such as odours (Mukabana et al., 2002a; Qiu et al., 2006), (effective) use of protective measures or behaviour will be relevant; in our study, bed net use and gametocyte carriage were not significantly associated with the number of mosquito bites an individual received though this study was not designed to assess the influence of these factors on mosquito exposure. Of note, the age distribution of our study population (Table 1) might not reflect the true demography of the region. Whilst our results are in agreement with previous studies, we cannot exclude that a difference in age composition related to the fact that only houses with at least one child were included in the study may have influenced our heterogeneity estimates. Furthermore, we observed that blood meals from 8.2% of tested mosquitoes did not amplify for human DNA. Although it is possible that some of these mosquitoes fed on domestic animals, since it is unlikely that non-human biting would divert bites from specific hosts, we do not expect this to bias our individual-level estimates. A technical limitation of this study was that our analyses only used data from ~70% of all successfully typed mosquito meals. Of those not matched, 139/292 were single blood meals from individuals not in our study houses and 153/292 had evidence of multiple blood meals. The distribution of these bites, each representing at least two host-vector encounters, is likely to be an important determinant of Anopheles exposure, in particular if some individuals are over-represented in these mixed meals, for example due to frequent defensive behaviour that leads to interrupted mosquito feeding and multiple probing. However, in a conservative sensitivity analysis that assigned these meals to the individuals with lowest exposure in each household, most mosquito bites were still linked to a small proportion of the population. Those mosquitoes whose blood meals did not match residents of study houses are likely to have fed in neighbouring houses or outdoors before entering study houses. The genetic profiles of these unmatched blood meals also suggest a heterogeneous feeding pattern: in the three houses with more than 10 unmatched mosquitoes, 16/41, 8/13 and 31/33 blood meals had the same profile. The only study house where a resident did not provide blood sample for matching had 8/10 unmatched meals presumably from the same human source. Concurrent collection of fed mosquitoes indoors and outdoors would help to understand how biting behaviour influences overall exposure. Broad differences in anthropophily between mosquito species are well recognised (Takken and Verhulst, 2013) however there are fewer data (Knols et al., 1995b) on whether different Anopheles species have different feeding preferences with regards to individual humans. In this study, we analysed blood meals in mosquitoes from three species: A. gambiae s. s., A. coluzzii and Anopheles arabiensis. Although seasonal differences in species abundance were evident, we observed aggregation in human biting irrespective of vector species and exposure to one species was positively associated with exposure to the others. Though we only collected endophillic mosquitoes, it suggests that where vectors are anthropophilic heterogeneity in exposure to anopheline mosquitoes is a common epidemiological phenomenon including in areas with mixed vector species. Additionally, we observed that the most numerous species in our study area, A. coluzzii and A. gambiae s. s., differed in two key parameters that influence the transmission potential of mosquitoes: the likelihood of feeding on multiple individuals and the prevalence of sporozoites. There is evidence from membrane feeding experiments performed in Senegal (Ndiath et al., 2011) that A. gambiae s. s. mosquitoes might be more susceptible to malaria infection, although this association was not observed in another transmission study (Gnémé et al., 2013). Another possible explanation for the observed species-related difference in sporozoite prevalence could be variation in mosquito survival and consequently age structure. The higher frequency of falciparum infection in A. gambiae s. s. mosquitoes confirms, together with its relatively high abundance, the prime importance of this species for malaria transmission in the study setting. The contributions of the different Anopheles species to the mosquito infectious reservoir also depend on the number of potential parasite inoculations per mosquito-time: mosquitoes with multiple blood meals are more likely to infect more than one individual on a single night compared to mosquitoes with single-source blood meals, assuming sufficient quantities of sporozoites are inoculated during the probing of the different hosts. The higher proportion of blood meals with multiple human DNA sources suggests that A. coluzzii mosquitoes also contribute significantly to the incidence of infection in humans. Importantly, as species composition of local vector populations varies in the course of the rainy season (Dao et al., 2014), these differences might impact the rate of infection propagation in human populations over the course of a single transmission season as relative abundances of the different vector species change. We also determined how the frequency of host-vector contacts might influence malaria infection risk in human populations. In our study area, there was considerable variation in household-specific exposure to sporozoite-positive mosquitoes (Figure 3). At the individual level, a few individuals received multiple potentially infective bites while between 75% and 90% of the study participants were not matched to feeding by infected mosquitoes during the three study periods. Whilst this does not represent all infected mosquito bites these individuals receive during an entire transmission season, it does highlight the degree of heterogeneity in likely parasite inoculations and the limitations of using population- or region-wide entomological measures of transmission that do not capture this small-scale variation. These results also suggest that the use of blood meal genotyping with concurrent assessment of mosquito sporozoite carriage during epidemiological studies could improve our understanding of the heterogeneity in clinical malaria risk (Mwangi et al., 2008; Loucoubar et al., 2013; Ndungu et al., 2015). Furthermore, whilst we observed a positive association between the total number of mosquito bites and the number of bites from sporozoite infected mosquitoes at the individual level, our data suggest clustering of sporozoite-positive mosquito bites at the household level that was not related to local mosquito abundance. This phenomenon could be linked to (i) a correlation between prevalence of infection in mosquitoes and in humans in the same households assuming limited mixing of mosquitoes and humans (e.g. due to the presence of breeding sites near houses, reducing the distances travelled by mosquitoes between consecutive blood meals [Le Menach et al., 2005], or to feeding site-fidelity in Anopheles mosquitoes [McCall et al., 2001]) or possibly to (ii) factors which affect mosquito survival on a very local scale, since mosquito age is associated with cumulative risk of sporozoite infection (Lines et al., 1991). In summary, although studies have assessed natural exposure to vectors of other infections, such as Aedes (Harrington et al., 2014; Liebman et al., 2014) and Culex (Michael et al., 2001), only limited data are available for Anopheles mosquitoes (Soremekun et al., 2004; Scott et al., 2006). In our field site, characterized by high malaria transmission intensity, we show significant heterogeneity both between and within households in terms of the number of mosquito blood meals and the distribution of potentially infectious mosquito feedings; these patterns are consistent with the 20/80 rule and support the design of interventions that aim to reduce transmission by targeting a small proportion of the population. Opportunities to specifically target high-exposure households depend on the operational feasibility to identify these households and the stability in exposure over time. A quantitative understanding of the processes leading to heterogeneity in mosquito exposure and its temporal variability would inform at which level such interventions may be targeted in different settings; this would require quantification of the relative contributions of household-level factors, differential attractiveness to mosquitoes and human behavioural factors. This study was conducted in Balonghin (health district of Saponé, Burkina Faso). The main economic activities in this area are subsistence farming and keeping livestock . Malaria transmission is seasonal, occurring between August and December following rainfall between June and September (Ouédraogo et al., 2013), and falciparum parasite prevalence is high, above 80% by 18S qPCR, during the transmission season (Gonçalves et al., 2017). At the time of this study, seasonal malaria chemoprophylaxis was not part of national guidelines in Burkina Faso. Indoor mosquito collections were performed at the end of the 2013 transmission season (October – December), and at the start (June – July 2014) and peak (September 2014) of the following wet season. Every week mosquito collections were performed in five households. Forty households with at least one household member <15 years of age were included in the first survey. For each household, mosquitoes were collected between 7 and 9 AM by mouth aspiration from walls and ceilings for a maximum of 15 min per sampling morning for seven days or until 30 bloodfed Anopheles mosquitoes were collected. In 2014, mosquito collections were performed in 20 of these 40 initial households over 10 days (5 days in July, and five in September). Bloodfed mosquitoes had their head-thoraces stored for speciation and malaria infection assessment by PCR (see below), and their abdomens containing blood meal material squeezed onto filter paper that was stored with desiccant until DNA extraction and further analyses. Finger prick blood samples were collected at enrolment and stored in RNAprotect Cell Reagent for automatic extraction of total nucleic acid using a MagNAPure LC automatic extractor (Total Nucleic Acid Isolation Kit–High Performance; Roche Applied Science, Indianapolis, IN, USA). 18S qPCR and Pfs25 mRNA qRT-PCR were used to detect falciparum parasites and gametocytes, respectively, using established protocols (Hermsen et al., 2001; Stone et al., 2017). Genetic typing of blood meal samples has been described in detail elsewhere (Gonçalves et al., 2017). Briefly, bloodfed mosquitoes’ abdomens were processed using Boom extraction method (Boom et al., 1990). The Authentifiler PCR Amplification kit (Applied Biosystems), with nine human microsatellite markers and one gender marker, was used to compare human DNA in blood meals and in blood samples collected from study participants. Capillary electrophoresis was used to determine DNA profiles. Mosquito blood meals with more than two alleles in at least three loci were considered to have multiple human sources. DNA was extracted from individual head-thoraces using the DNAzol procedure (Invitrogen, Cambridge, UK). Mosquito speciation was performed using a single PCR-RFLP assay as described by Fanello and colleagues (Fanello et al., 2002), and nested PCR (Snounou et al., 1993) was used for Plasmodium falciparum detection. Stata version 14 (Stata Corporation, College Station, TX, USA) was used for statistical analysis. Demographic data were not available for five houses where no bloodfed mosquitoes were collected; study participants living in these households are not included in the analyses presented here. We used the number of bloodfed Anopheles mosquitoes collected per day per household when comparing different surveys. Wilcoxon signed-rank test was used to assess within-household changes in Anopheles abundance. To estimate household-specific exposure to infected mosquitoes (Figure 3), we only considered singly matched mosquitoes and mosquitoes with blood meals that had multiple human DNA sources, and excluded from these calculations mosquitoes whose blood meals did not match house residents; for individuals with at least one matched mosquito that was not tested for sporozoite status, the number of infected bites was estimated based on total number of matched meals and proportion of tested mosquitoes that were positive. A mixed effects logistic model was used to assess the association between mosquito falciparum infection status and mosquito species; the analysis was adjusted for survey time (fixed effect), and household of collection was used as random effect. To describe the temporal variation in relative abundance of the different Anopheles species, data from all mosquitoes with speciation results were used. In other analyses, that assessed Anopheles species-specific proportions of blood meals with multiple human sources and prevalences of sporozoites, only data from mosquitoes with both blood meal and head-thorax molecular assays were included (645/666 singly matched, 151/153 multiple, and 132/139 non-matched meals). To generate Figure 1b and estimate the highest proportion of singly matched mosquito meals linked to 20% of study participants, only individuals who were present in at least three collection days were considered. Mixed effects negative binomial models (Hilbe, 2011; StataCorp et al., 2013) were used to assess overdispersion in exposure to mosquitoes, after adjustment for variability linked to age categories and survey time (fixed effects) and household-level variation (random effect). These models were also used in Anopheles species-specific analyses. Likelihood-ratio test compared mixed effects negative binomial models and mixed effects Poisson models. Ethical clearance was obtained from the London School of Hygiene and Tropical Medicine ethics committee (reference number 6447), and the ethical review committee of the Ministry of Health of Burkina Faso (2013-7-58). Transactions of the Royal Society of Tropical Medicine and Hygiene 72:6–15. Journal of Clinical Microbiology 28:495–503. Bulletin of the World Health Organization 56:147–154. Transactions of the Royal Society of Tropical Medicine and Hygiene 96:499–506. Transactions of the Royal Society of Tropical Medicine and Hygiene 80:69–77. Medical and Veterinary Entomology 16:461–464. PLoS Neglected Tropical Diseases 8:e3048. Molecular and Biochemical Parasitology 118:247–251. United Kingdom: Cambridge University Press. International Journal of Epidemiology 42:235–247. Transactions of the Royal Society of Tropical Medicine and Hygiene 89:604–606. Proceedings of Experimental and Applied Entomology 6:201–206. PLoS Neglected Tropical Diseases 8:e2702. Journal of Medical Entomology 30:368–373. Transactions of the Royal Society of Tropical Medicine and Hygiene 95:587–590. The American Journal of Tropical Medicine and Hygiene 65:722–728. College Station, Texas: Stata Press. Bulletin of Entomological Research 70:133–144. Medical and Veterinary Entomology 20:280–287. The American Journal of Tropical Medicine and Hygiene 75:231–237. Molecular and Biochemical Parasitology 61:315–320. Tropical Medicine and International Health 9:664–672. The Journal of Infectious Diseases 216:457–467. Annual Review of Entomology 58:433–453. Proceedings of the Royal Society B: Biological Sciences 245:109–114. Thank you for submitting your article "Variation in natural exposure to anopheles mosquitoes and its effects on malaria transmission" for consideration by eLife. Your article has been reviewed by 3 peer reviewers, and the evaluation has been overseen by Marc Lipsitch as Reviewing Editor and Prabhat Jha as the Senior Editor. The following individuals involved in review of your submission have agreed to reveal their identity: Marc Lipsitch (Reviewer #1); William Hawley (Reviewer #2); Richard Paul (Reviewer #3). This is a well-written manuscript that quantifies the uneven distribution of bites by malaria vectors within and between households in a village in Burkina Faso. With the specific exceptions noted below it appears to be a well-done study that is one of only few to document this phenomenon in the field using a large survey and capturing the detail (vector species, infected vs. total bites, within and between households, demographic predictors). The phenomenon has been shown theoretically to be important, so documenting how large it is makes a significant contribution to the field, which will be interesting to anyone concerned about malaria and to others interested in the role of heterogeneity in infectious diseases. Revisions below are requested to improve the understanding of readers (including non-specialists) of the context and precise implications of the finding. The authors cite compelling theoretical demonstrations that R0 is massively inflated with this level of heterogeneity, compared to all behavior being average (random biting). It is not clear to me for an infection with slowly-developing immunity that R0 is the best measure of impact. Suppose in the extreme case that all the mosquitoes exclusively bit 2 people of the 100 in a community. That would certainly make for a high R0 and make control by say mass vaccination or mosquito control challenging (in proportion to R0 inflation). It wouldn't however increase the burden of disease much and might decrease it, as these people would rapidly become immune, making bites on them less productive of gametocytes and further transmission (to the extent that immunity impacts transmission). Moreover (as in STI models) extreme specialization of this sort increases R0 but not necessarily prevalence because some "nonspecialized" bloodfeeding is necessary to disperse infection into the wider community. This is an important limitation of the R0-focused presentation. This paper is not the place to develop the theory further, but I think emphasizing the impact on R0 means the discursive parts of the manuscript should focus on the difficulty of control (which is proportional to R0) not "transmission" or "endemicity" generally, which does not follow in a simple way. Another perspective on the same issue: It might be worthwhile to state that the absolute values of R0, as calculated, are notional in the sense that these are the values that would pertain in the absence of any control and any population immunity. In the case of Burkina, there's plenty of both control effort and immunity, so the actual R0 is considerably less. The important lesson is that some means for better targeting control measures might be considered. Some of these are by now anodyne – we can't merely target children, but adults must be included in our efforts. We are already know that poor housing and poverty are associated with higher prevalence of malaria. While this paper very convincingly tells us that there is individual level variability in transmission – strongly associated with spatial factors – we don't yet know whether the observed spatial heterogeneity in transmission is temporally stable. If it isn't, then targeting of interventions will be hard to accomplish. But for the purposes of publication decision, this is not really of importance, as the paper presents splendid data confirming some long-held theoretical and field-based suspicions. 2) Figure 2. The reviewers had divergent opinions on the figures. Two of us found this figure in particular quite confusing. Another wrote "The figures are lovely, creative, and informative, once their code is understood." It is up to the authors to consider whether greater clarity can be achieved without sacrificing information or readability. Also it would be helpful to describe Figure 2 more explicitly in the text. 3) Figure 4. We don't understand how there are 3 different curves since 1/k should give a single curve. This must be because the fold increase depends on more than 1/k, and I just don't follow the figure legend, which should provide the formula. 4) “…in our study, bed net use did not significantly influence the number of mosquito bites an individual received (P = 0.72)…”. This result should not be presented for the first time in the Discussion. A p value with no mention of effect size or CIs is bad statistical practice. More generally, the list of factors considered as potential risk factors should be presented with univariate association measures provided (point and CI); as it is we don't know what the authors tried and only know that one association was null, but not whether it was convincingly close to null or just underpowered (narrow or wide CI respectively). 5) The fifth paragraph of the Discussion is hard to understand – could not identify the main point. 6) Subsection “Study area and mosquito collections”. We would like more information. I don't understand what was done. How were households chosen and individuals in them identified? Was sleeping in the household the night of the mosquito collection necessary for inclusion (if not, maybe some heterogeneity is just because someone wasn't there). What is the mosquito trapping protocol (I don't know about mouth aspiration but want more detail anyway about how long, where, what kind of traps etc.)? 7) The paper's penultimate sentence looms over this effort: "…support the design of interventions that aim to reduce transmission by a targeting a small proportion of the population." The theoretical literature already admonishes us to do this, but your data help us to grapple with the question – should we be targeting households or individuals? I think the data clearly support the former, and would suggest that your Discussion say so. Figures 3A, Figure 2—figure supplement 1, and your regression analysis – "there was no evidence of individual level clustering after adjustment for household related variability (p = 0.50)” – all support the conclusion that the challenge to programs is to identify houses that attract the most mosquitoes, and not, thankfully, the most attractive individuals within houses. To gain this understanding, you advocate for "studies that combine mosquito blood meal typing and parasitological and clinical follow up"; in an earlier phrase "factors which affect mosquito survival on a very local scale" are mentioned. What about the distribution and productivity of larval habitats? In a paper about heterogeneity, this is an essential and extremely heterogeneous (spatially and temporally) fact of nature that should be considered if we are to figure out how to target the individuals living in high transmission houses. Even if you don't agree with my interpretation of your data, I think it would be worthwhile to address the 'what do we need to target? – individuals or households?' question more directly if the intent is to inform research of programmatic usefulness. 8) It would be helpful to summarize key features of malaria transmission in this area: what is the prevalence of parasitemia or other measures of transmission, and what is the nature and extent of interventions in place? The most surprising absence, given that people were bled for human genotyping and given that LaCroix et al. (LaCroix et al., 2005) showed an increased attractiveness of parasite infected people to mosquitoes, is that there is no information given on the parasite prevalence in the population at an individual or even general level (how much malaria is there and when). The mosquitoes were examined for parasite sporozoite stages, but if the bloodmeals were squeezed out for typing and the abdomens remained, then surely the mosquito bloodmeal could have been checked for parasites. We agree that the fold-changes in R0, presented in Figure 4, do not necessarily reflect the true relationship between heterogeneity in vector exposure and local human infection burden (prevalence or incidence). We would also concur that highly heterogenous transmission can result in an extreme scenario where the infection burden is concentrated in, or even confined to, a very small proportion of the population. Therefore, R0 is more representative of the coverage level of non-targeted vector control interventions required to interrupt transmission. We agree that absolute values of R0 should be interpreted in the context of interventions that reduce the actual reproduction number. Because of this obvious discordance, we did not estimate local malaria R0, opting instead to present changes in R0 (relative to a homogenous-biting system) estimated from the new data on biting variation. As noted in the response to the previous comment we have revised the Discussion to point out 1) that R0 calculations concern scenarios where no control measures are in place in a population of immunologically naïve individuals, 2) that malaria R0 might not be the best measure to assess the impact of biting heterogeneity on local malaria burden, 3) that R0 amplification due to variation in mosquito exposure determines requirements for control strategies to be effective, and 4) that more complex mathematical models that account for correlations between malaria exposure and rate of immunity acquisition might inform how the distribution of mosquito bites influences different human malaria metrics. In addition to these modifications related to R0, we also agree with the reviewers that characterising the temporal variation in the spatial distribution of mosquito bites is essential to determine the feasibility of spatially targeted interventions. Bejon and colleagues showed that foci of clinical malaria are unstable and that one-month surveillance data might only have predictive value of future hotspots for short periods of time (A micro-epidemiological analysis of febrile malaria in Coastal Kenya showing hotspots within hotspots. eLife 2014). This is consistent with our observation that the ranking of houses according to the number of infected mosquito bites per individual varies over time (Figure 3). To this, we add that determining the spatial scale of malaria transmission is also important. The average distance between locations where consecutive blood meals of the same mosquito take place is likely to influence the contribution of different households to community-wide transmission, and consequently is a measure of the maximal efficacy of spatially targeted interventions (see Perkins et al. Heterogeneity, Mixing, and the Spatial Scales of Mosquito-Borne Pathogen Transmission. PLOS Computational Biology 2013 for a detailed discussion on spatial scale of malaria transmission; see McCall et al. Evidence for memorized site-fidelity in Anopheles arabiensis. Trans R Soc Trop Med Hyg. 2001 and Le Menach et al. The unexpected importance of mosquito oviposition behaviour for malaria: non-productive larval habitats can be sources for malaria transmission. Malaria Journal 2005 for possible mechanisms influencing the scale of transmission). We modified the following paragraph to emphasize the need to quantify temporal variation in the spatial distribution of mosquito bites. These changes are equally relevant to comment 7. We have now modified Figure 2 to present temporal variation in exposure in one single panel. This information is now represented in linear scale. We have also modified the Results section and the Materials and methods section where the calculations used to create the previous panels A and B were described. The different curves in Figure 4 represent the effect of aggregation (1/k) on malaria R0 in areas with mosquito exposure levels (i.e. average number of mosquito bites) similar to those observed in our study (i.e. start [blue], peak [orange] and end [green] of transmission season). These calculations are not intended to reflect seasonal biting variation, but rather to provide estimates of R0 amplification in theoretical settings with vector densities and biting variation similar to those observed at different times in our study area. To clarify this, we have modified the legend of Figure 4 and the Results section (see below). Additionally, when addressing this comment, we found an error in the calculations of the R0 inflations. Essentially, the coefficient of variation was miscalculated as the variance divided by the mean bite rate when it should have been the standard deviation divided by the mean. While the biting variation recorded in the field still inflates R0 considerably, the inflations are attenuated (now resulting in 4 to 8-fold increases in R0 relative to homogenous mixing). We have corrected the sub-section “Effect of exposure heterogeneity on malaria R0” in the Results section to reflect this change. These do not alter the overall message of the manuscript or the large majority of the presented results. The corrected R0 calculation resulted in changes in the last paragraph of the Results section and one paragraph in the Discussion section, the actual presentation of all entomological data is unaltered and correct. 4) “… in our study, bed net use did not significantly influence the number of mosquito bites an individual received (P = 0.72)…”. This result should not be presented for the first time in the Discussion. A p value with no mention of effect size or CIs is bad statistical practice. More generally, the list of factors considered as potential risk factors should be presented with univariate association measures provided (point and CI); as it is we don't know what the authors tried and only know that one association was null, but not whether it was convincingly close to null or just underpowered (narrow or wide CI respectively). We previously showed that age influences mosquito exposure in this area (Gonçalves et al. Examining the human infectious reservoir for Plasmodium falciparum malaria in areas of differing transmission intensity. Nature Communications 2017). Here, we also assessed the effect of bed net use on mosquito exposure, although as we mentioned in the Discussion section, the study was not designed for this. We modified the Results section to describe the analysis that includes bed net use. Additionally, to address another comment (see “Optional major revision”), we have now included a statement on the effect of parasite carriage on mosquito biting. In this paragraph, we discuss the effect of the heterogeneity described on the distribution of potentially infectious bites from mosquitoes. As with total mosquito counts, most sporozoite-positive mosquito blood meals were matched to a small proportion of participants. An unexpected finding was that infected bites clustered at the household level after adjustment for the number of mosquitoes collected. We believe this observation is important since it might be linked to previously unrecognized epidemiological phenomena. Indeed, possible explanations for this include 1) household-level differences in mosquito survival and average age, where mosquito age is associated with cumulative risk of infection (Lines et al. Human malaria infectiousness measured by age-specific sporozoite rates in Anopheles gambiae in Tanzania. Parasitology 1991), and 2) a time-lagged correlation between prevalences of infection in mosquitoes and in humans in corresponding households. Explanation 2 implies limited movement of mosquitoes in some areas, i.e. the distance travelled by mosquitoes between consecutive blood meals is small. This might occur for example in houses located near breeding sites, which allow oviposition after blood feeding and might increase the probability that mosquitoes feed in the same house afterwards. Another mechanism could involve feeding site-fidelity as previously described (McCall et al. Evidence for memorized site-fidelity in Anopheles arabiensis. Trans R Soc Trop Med Hyg. 2001). We have improved the clarity of this paragraph. We have removed the statement that contrasted the proportion of the study population linked to potentially infective blood meals and the prevalence of infection in this population, since these two quantities are not directly comparable (we assessed exposure to infected mosquitoes during one week at the end of the transmission season, while infections in humans can last several months [Felger et al. The Dynamics of Natural Plasmodium falciparum Infections. PLoS ONE 2012]). We also included additional information about the clustering of infected mosquitoes at the household level. “We also determined how the frequency of host-vector contacts might influence malaria infection risk in human populations. In our study area, there was considerable variation in household-specific exposure to sporozoite-positive mosquitoes (Figure 3). […] This phenomenon could be linked to i) a correlation between prevalence of infection in mosquitoes and in humans in the same households, assuming limited mixing of mosquitoes and humans (e.g. due to the presence of breeding sites near houses, reducing the distances travelled by mosquitoes between consecutive blood meals (Le Menach et al., 2005), or to feeding site-fidelity in Anopheles mosquitoes (McCall et al., 2001)), or possibly to ii) factors which affect mosquito survival on a very local scale, since mosquito age is associated with cumulative risk of sporozoite infection (Lines, Wilkes and Lyimo, 1991). Households with at least one child were eligible for inclusion in the first entomological survey. Residents in study houses were enrolled and asked to provide a finger prick blood sample that was used to match mosquito blood meals to humans. In the second and third surveys, twenty houses from the first survey with no changes in the number of residents (e.g., no births or deaths) were sampled again for bloodfed mosquitoes; priority was given to houses with highest mosquito exposure in the first survey. For the duration of catching in each survey we recorded whether each participant was present in the study house during the nights preceding mosquito collections. We used this information as exposure variable in statistical models of mosquito biting, including in the negative binomial models, and to exclude individuals with limited exposure data from some of the figures (Figure 1, Figure 2 and Figure 1—figure supplement 1). Of note, demographic groups are targeted in some settings primarily for morbidity reduction -SMC, IPTp,I etc., though some of the data from SMC suggest there may also be a community effect on parasite prevalence in targeting children under 10. In a related analysis, we estimated the contribution of different age groups to transmission after accounting for the age structure of the population, relative infectivity and heterogeneity in exposure. Extending drug delivery to older groups via SMC or through schools represents a logistically attractive complimentary approach to vector control. Data from a recent epidemiological study showed that the prevalence of falciparum parasites during malaria transmission season was 83.8% by molecular methods, which is similar to the prevalence of 79.2% during the first mosquito collection survey. While seasonal chemoprophylaxis was not recommended in Burkina Faso at the time of this study, reported bed net use was high (90.0%, 87.1% and 88.6% for children < 5 years, schoolchildren and adults, as we previously described [Gonçalves et al. Examining the human infectious reservoir for Plasmodium falciparum malaria in areas of differing transmission intensity. Nature Communications 2017]). We now mention this information in the Materials and methods and Results sections. In response to the reviewers’ comment, we have now included parasitology data for the first season when samples were available for this purpose. We tested these human samples, stored in RNA protect cell reagent, for parasite and gametocyte detection using 18S qPCR and Pfs25 qRT-PCR and results are now included in the Results section and in Table 1. We observed high parasite and gametocyte prevalence in human samples and, potentially because of this, there was no association between mosquito exposure and parasite carriage in humans. We do agree that this is an interesting phenomenon and highly valuable to explore in the context of natural mosquito exposure. Given the estimated effect sizes of gametocyte carriage (~2-fold higher mosquito exposure; Busula et al. J Infect 2017; Lacroix et al.PLoS Biol 2005) and body surface area/age (up to 21-fold higher exposure, Gonçalves et al. Examining the human infectious reservoir for Plasmodium falciparum malaria in areas of differing transmission intensity. Nature Communications 2017), it may be challenging to reliably detect and quantify an impact of human parasite status on mosquito exposure in natural settings. We would like to thank the families who participated in this study. This work was supported by the Bill and Melinda Gates Foundation (AFIRM OPP1034789). TB is further supported by a fellowship of the Netherlands Organization for Scientific Research (VIDI fellowship grant number 016.158.306). Human subjects: Written informed consent was obtained from study participants. Ethical clearance was obtained from the London School of Hygiene & Tropical Medicine ethics committee (reference number 6447), and the ethical review committee of the Ministry of Health of Burkina Faso (2013-7-58). © 2018, Guelbéogo et al.